FOR MANY people, Christmas and New Year's feel like anything but the most wonderful time of the year. Some find the long winter nights depressing. Others can't muster much merriment in the face of what can seem like an endless procession of bleak headlines. Still others yearn for the sweetness of auld lang syne, when life moved at a more humane pace, and concerns that generate such angst today — global warming, identity theft, Islamist terror, campaign finance — troubled no one's sleep. Well, for anyone who could do with some extra cheer, a book published 40 years ago — "The Good Old Days — They Were Terrible!" — brims with reminders of all the blessings we have to count. Its author was Otto L. Bettmann, a refugee from Nazi Germany who created the Bettmann Archive, one of the world's most important and extensive collections of historical images. In 1974 he set out to dispel the notion that life in America two or three generations earlier had been an idyll of freshness and simplicity, the benign and picturesque era of Currier & Ives prints and classic Christmas carols. Bettmann acknowledged that his famous archive had helped create that impression of a lost golden age. Many of its most popular pictures "do indeed exude an aura of charm and well-being," he wrote. But there were countless others, less sought-after, that told a far more realistic tale. It was dangerous to romanticize the past, Bettmann argued. For one thing, it was an assault on the truth: Living conditions in America on the eve of the 20th century were frequently poor, nasty, and brutish. 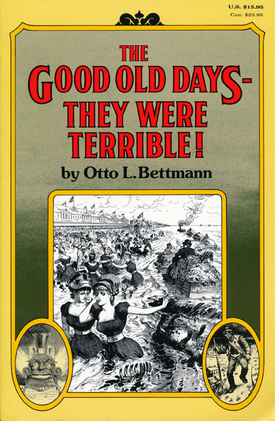 Bettmann filled his book with images refuting the idea that the "good old days" were a paradise from which we have sadly fallen. Like its title, "The Good Old Days — They Were Terrible!" is unflinching yet confident. To read it is to be liberated from unhealthy nostalgia, and to be buoyed by a powerful reminder of our potential for human progress. We are endlessly hectored these days about the evils of the automobile and "carbon pollution," to take a single example of a contemporary boon all too often condemned by those nostalgic for an illusory past. Bettmann supplies invaluable perspective, recalling how befouled American streets and cities were before the "timely arrival" of the internal-combustion engine. At the turn of the last century, he recounts, transportation in US cities required about 3 million horses, each producing 20 to 25 pounds of manure per day. "These dumplings were numerous on every street, attracting swarms of flies and radiating a powerful stench. The ambiance was further debased by the presence on almost every block of stables with urine-saturated hay." In one modest-sized city — Rochester, NY — 15,000 horses "produced enough manure in 1900 to cover an acre of ground with a layer 175 feet high." The ubiquitous pollution didn't come only from horses. All the "wastes of daily life, including kitchen slops, cinders, coal dust, horse manure, broken cobblestones, and dumped merchandise, were piled high on the sidewalks. There was hardly a block in downtown Manhattan that a pedestrian could negotiate without climbing over a heap of trash or, in rain, wading through a bed of slime." Parking hassles in our era can be maddening, but who wouldn't prefer them to the foul congestion of the Gilded Age? Bettmann describes "sidewalks . . . lined with unharnessed trucks, beneath and between which dirtier citizens threw their filth." At times New York reeked like a vast stable, one visitor commented — and what was true of the nation's largest municipality was true of smaller cities as well: "Pioneers trekked westward to breathe what they expected would be the fresh air of small frontier towns. What they often encountered was air like that of a malarial swamp." 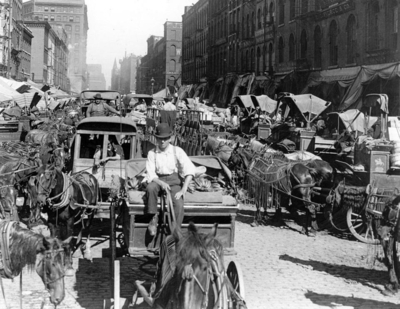 A photograph of Helena, Mont., illustrates the point, depicting a busy street clogged with wagons, where hitching places for horses regularly turned into cesspools. But at least roads were safer before the advent of car accidents, right? Wrong. Runaway horses were a serious danger, creating "havoc [that] killed thousands of people," Bettmann writes. "According to the National Safety Council, the horse-associated fatality rate was 10 times the car-associated rate of modern times." From housing to education, street crime to medical care, urban sweatshops to rural despair — on topic after topic, Bettmann's pictorial history strips away the idealized sheen of wholesomeness from America's "good old days." Neither paean to laissez-faire capitalism nor endorsement of vigorous government regulation, it is instead a frank reality check into the past that makes clear how blessed we are to be alive in the present. The cynic's definition of optimist is a man who never had much experience. Bettmann knew better, and was happier for it. He relished being "a man of experience who remains a confirmed optimist." Forty years on, his book is still in print — and more than ever an antidote to the blues, holiday or otherwise.